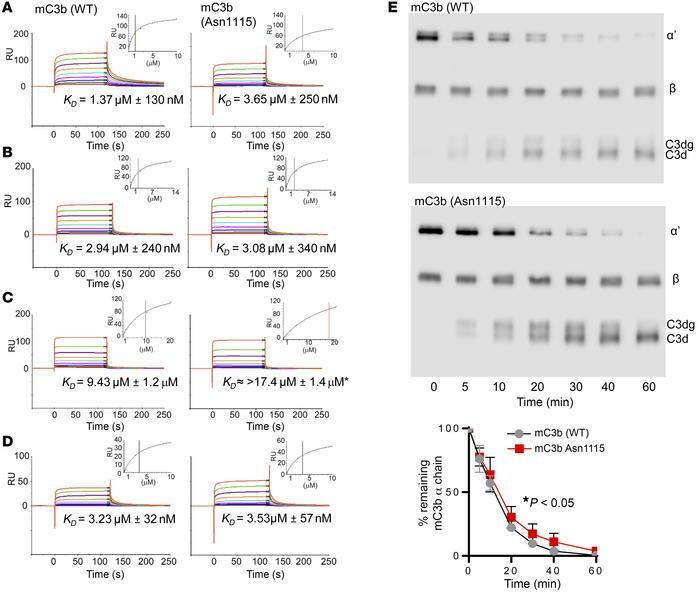 Molecular basis of complement dysregulation in C3KI mice. SPR analysis using mouse C3b derived from WT or C3KI mouse plasma. Mouse C3b was amine coupled to a CM5 biosensor chip (930 ± 10 RU). Doubly diluted concentration series of (A) purified murine FH (0 to 10 μM), (B) recombinant murine FH SCRs 1–5 (0 to 14.6 μM), (C) recombinant human FH SCRs 19-20 (0 to 20 μM), or (D) recombinant murine Crry SCRs 1–5 (0 to 10 μM) were flowed across the chip surface. The equilibrium dissociation constant KD was calculated using a steady-state model in the Biacore evaluation package, indicated as the black vertical line. *At the concentration range assayed here, human FH19–20 was not able to achieve saturated binding on the C3b Asn1115 surface; thus, an underestimated KD is indicated by the red vertical line. (E) Representative gels showing plasma-purified murine C3, as indicated, incubated with human FI and FH in a fluid phase cofactor activity assay, with densitometry analysis (Image Studio version 5.2) of intact α chain shown below; shown is the average of 3 experiments ± SEM with unpaired t test.